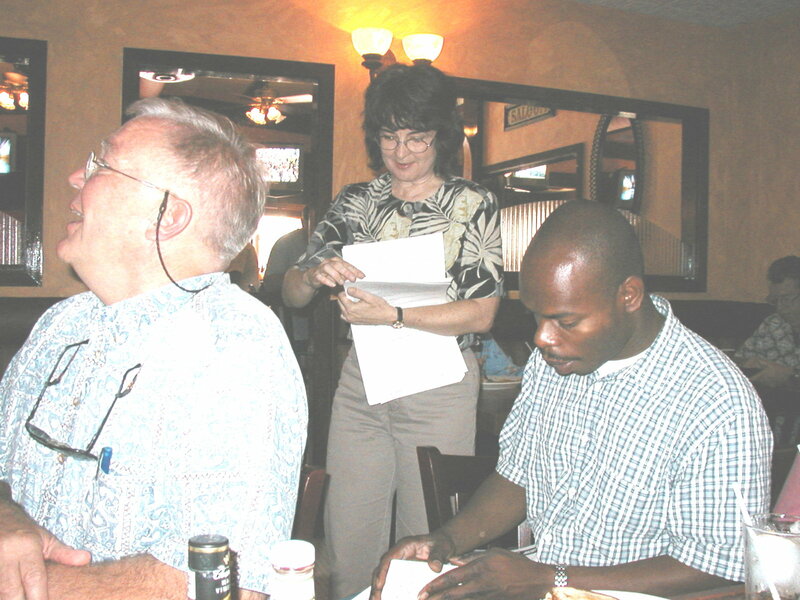 (Sept. 9, 2001) -- Supporters of a "Son of Prop J" ballot measure that would let voters end the City Council imposed utility tax on City Hall-run gas and water utilities held a signature gathering party at E.J. Malloy's in Bixby Knolls on Saturday, Sept. 8. About two dozen people turned out and left armed with petitions accommodating many more signatures. Among those attending (shown in picture above) were Roger Erickson, Colette Marie McLaughlin, Lewis Lester. Others attending included Ron Noe, John Deats, Norm Ryan (leader of the successful Prop J utility tax cut drive and now a Mayoral candidate), Traci Wilson-Kleekamp, Bry Myown, Skip Blas, John Donaldson, Johnny Donaldson, Lou Baglietto, Paul de Jung and Dina Predisik. Mr. Noe told LBReport.com supporters of the grassroots petition initiative are "avidly looking" for more volunteers to help gather at least 3,882 valid signatures needed to qualify for the ballot. Supporters are optimistically shooting for mid-October, an early date (and not the final "drop dead" deadline) that would let the measure appear on the April, 2002 city ballot, coinciding with the Mayoral primary and 1st, 3d, 5th, 7th & 9th Council district primary races. Noe said the group planned to hold another signature gathering party soon to keep the momentum going.